We believe in educating the whole child — academically, physically, spiritually, and emotionally. Our balanced curriculum includes arts, music, physical education, character development and religious studies. Even at a very young age, students begin developing their identity by exploring the joy of artistic expression. We give our students the opportunity and the freedom to do just that. Art & crafts are integral parts of our Preschool curriculum as well as a cornerstone of our Kindergarten activities. 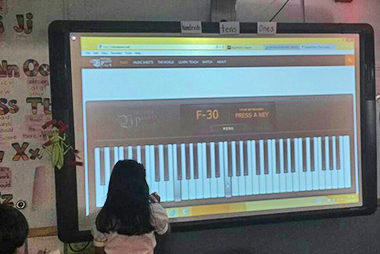 Our music program establishes a firm foundation through the understanding of music fundamentals using voice and keyboard. As the children progress, our faculty are able to customize the curriculum and encourage students in the area where they demonstrate a particular interest or talent.